(Colonia, Yap) Students on Micronesia's famously traditional Island of Stone Money have begun to design and assemble hi-tech programmable robots. Using the raw parts, students will be able to design, build, and code robots to compete in a statewide STEM exhibition and robotics competition in May. 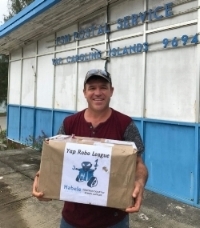 Yap’s Robo League was established in 2011 by the US-based nonprofit “Habele." It is now expanding across that state through a pilot grant award by the Office of Insular Affairs. “We were inspired by the students from Yap who represented the Federated States of Micronesia this summer at the 2017 FIRST Global Challenge international robotics competition for high school students here in Washington, D.C.,” said OIA Director Nik Pula. “Through robotics, the Habele Outer Island Education Fund has been promoting the broadening of students’ experience in applying basic Science, Technology, Engineering, and Math skills in a positive, competitive, and hands-on way, and we are pleased to support expansion of this opportunity for more students in Yap,” continued Pula. Pupils and teachers at Yap Catholic High School have taken the lead as peer mentors, supporting expansion of the Robotics Team at the Yap SDA School and the creation of new robotics clubs at Yap High School, Outer Island High School, and Faith Academy. Their efforts follow community meetings held by Habele in early Fall to gauge interest and develop plans for the league expansion. While students at the five schools have begun tinkering, teachers and administrators are coordinating for a series of technical trainings in late 2017 and early 2018 to guide their student’s work. The teams’ skills, developed over the coming months, will be showcased in a public five school robotics competition on May 22, 2018.